With a rich history of custom developments and video analytics breakthroughs, using existing intuVision products and technology components we can create unique custom video analytics solutions in record time. intuVision provides customizable intelligent video solutions for various end-user requirements. Using existing intuVision products and technology components we can create unique custom video analytics solutions in record time. We feature the technology components and our custom solutions examples here. While these solutions aren't available off-the-shelf, we have all components to offer these solutions, or those similar. We take your requirements into account, and are happy to white-label custom developments if required for resale. The intuVision team has in-depth knowledge and expertise in computer vision complemented by strong software and system development skills to successfully create high performance yet efficient and intuitive products and solutions. We work with small and large clients to develop customized security and surveillance solutions to meet the unique needs of each deployment. intuVision has designed and developed the prototype VISA system to detect active surveillance around individuals. This system works with intuVision VA to analyze the video stream to determine if the individual of interest is being followed by others, having applications in forensic video analysis. The image below shows the individual(in red) and the other people in the scene. Those that are trailing are shown in yellow. The rays emanating from the ellipse indicate the line of sight around the individual. 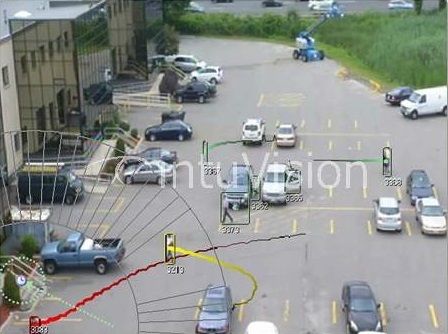 Further iterations of this project include detection and categorization of people and vehicles in scenes, with detected people and vehicles filtered by date, time, camera, and color - to allow operators quickly and efficiently track people as they move from camera to camera. This functionality has since been added to intuVision VA in the form of object track and color search. The intuVision VA light web server offers access to event alarm marked-up images and RSS feed for alarm event information. Users can now subscribe to this service and get event and alarm updates from anywhere they have access to internet. 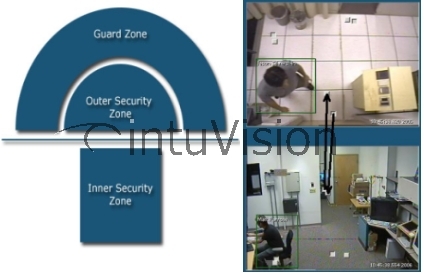 In this project intuVision has designed and developed a prototype system that uses video analytics to implement a “one person at a time enter/exit policy” to secure areas. The Virtual Mantrap controls the flow of people through designated zones with audiovisual cues and warnings. In order to ensure that the cues are obeyed and to determine when to sound warnings, intelligent video is employed. When a person enters security information, in the form of a biometrics scan or a security card, the surveillance video ensures that employee is the only one to enter the secured area. If any other person attempts to enter the area without entering his/her information, the video analytics catches this event in real time, issuing a warning to the security staff. The Virtual Mantrap System includes 3 designated zones that can be marked on the video scene, corresponding to the following zones on the floor as depicted in the graphic below. Guard Zone: The watch area adjacent to the outer security zone. 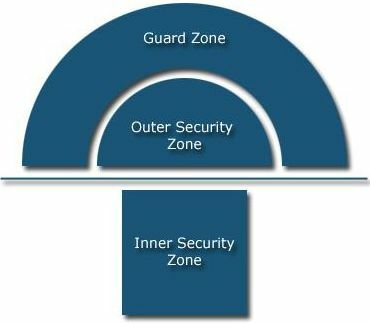 Outer Security Zone: The area immediately outside the secure area door, it includes a biometric access control device. Inner Security Zone: The area inside the secure area door. As people are tracked with the video analytics between these zones, their actions define a set of events. These events are composed of information from observations of existence and the position of people in the zones, Iris-scan and Face Recognition Biometrics, and the secure area door “open/close” status. This information is determined in real time and if the accumulated information corresponds with unwanted events, alarms are triggered in a variety of customizable ways. An example of an unwanted event is: the person performs an Iris-Scan, but instead of entering the room, steps aside and allows another person, who did not perform an Iris-Scan, to enter the room. A robust implementation for tracking objects between multiple camera views based on object motion, position and appearance models. A state machine was developed to model the current status of each “zone” and the state of the door and the access control systems. This approach was chosen in order to consistently combine the status information from multiple “zones” and the component systems. A unified framework for video tracking and biometric (Face and Iris) access control system metadata transfer which embeds the known ID of tracked people as metadata into object tracking. Soft Biometry features are those that provide categorical information about people, such as gender, ethnicity and size, but are not enough to uniquely identify a person. Our new technology focuses on categorical classification of people from ordinary video. 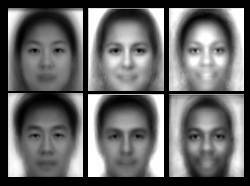 The images to the right depict "average" male and female faces for Asian, Caucasian and African American ethnic groups. These faces are generated with composites of several hundred face images. intuVision's video Soft Biometry analysis with face-based gender and ethnicity classification provides categorical information about people, such as gender, ethnicity, age and size, but not enough information to uniquely identify a person. 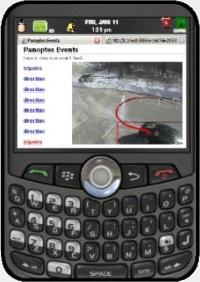 This technology has applications in both surveillance and forensic video analytics. Soft biometric features are extracted and accumulated for each person in every frame to build a dynamic soft biometric feature list for each tracked person in surveillance videos.